The risk information needs of the CFO include both internal and external drivers and risk factors. The area that has challenged many organizations is the oversight and management of externally driven risks and this Playbook addresses that need. 1. Does the organization adequately monitor and document information about external risk events and factors that have been identified as having a potential impact on objectives? 2. Have those with responsibility for managing each risk or risk type and those in charge of business processes affected by such risks established a system of triggers, notices and reports to ensure that they respond to identified changes as needed to maintain strong risk management? 3. Is there an effective method of mapping each risk to related objectives, related business processes,established controls and other relevant information? 4. How can the organization best organize this critical information to ensure that it is agile and responsive to change in a way that enhances the reliability of the achievement of objectives? The playsheets in this Playbook will help you to organize the information needed to answer these questions. Please provide your email address so we can send you "What the CFO Needs to Know About External Risks - A Principled Performance Playbook". SAP is the sponsor of this material.I acknowledge that I have read the SAP Privacy Statement and consent to the processing of my personal data in accordance with the terms of the Privacy Statement. Would you like to receive additional SAP communications along with information related to this inquiry by phone? Would you like to receive additional SAP communications along with information related to this inquiry by email? 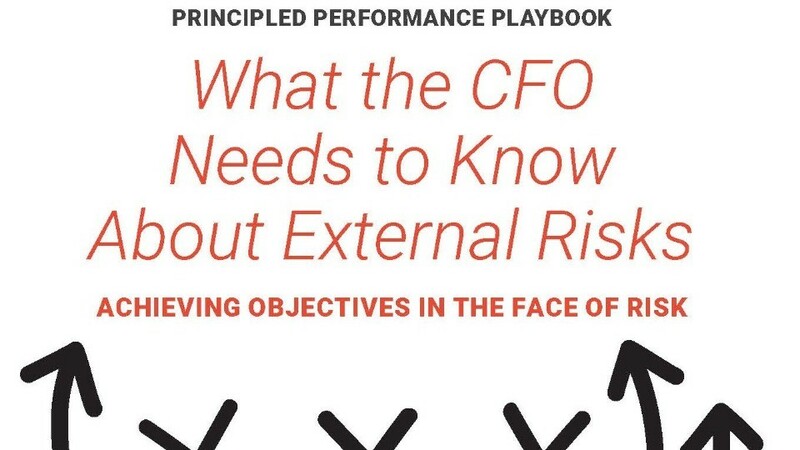 A link to "What the CFO Needs to Know About External Risks - A Principled Performance Playbook" was sent to Make sure the email arrives in your inbox: either add "support@oceg.org" as a safe sender to your email platform, or if you use Gmail, drag our email into your Primary tab.